Ultravox (formerly known as Ultravox!) are a British new wave band, formed in London in 1974 as Tiger Lilly. Between 1980–86, they scored seven Top Ten albums and seventeen Top 40 singles in the UK, the most successful of which was their 1981 hit "Vienna". The band has been led by two different frontmen who never played together in the band at the same time. From 1974 until 1979, singer John Foxx was frontman and the main driving force behind Ultravox. Foxx left the band to embark on a solo career and, following his departure, with the three remaining members in hiatus, Midge Ure took over as lead singer, guitarist and frontman in 1980 after he and keyboardist Billy Currie worked in the band Visage. Ure revitalised the band and steered it to commercial success lasting until the mid-1980s. Ure left the band in 1987 after establishing his own solo career and the group disbanded for a while. A new line-up, led by Currie, was formed in 1992, but achieved little success. The band's best-known line-up of Currie, Ure, bassist Chris Cross and drummer Warren Cann reformed in 2008 and performed a series of reunion shows in 2009 and 2010 before releasing a new studio album, Brill!ant, in May 2012. In November 2013, Ultravox performed as special guests on a four date UK arena tour with Simple Minds. With the band seemingly over, Ultravox were then revitalised by Midge Ure, who joined the band as vocalist, guitarist and keyboardist. He had already achieved minor success with semi-glam outfit Slik and Glen Matlock's The Rich Kids, and in 1979 he was temporarily playing with hard rock band Thin Lizzy. Ure and Billy Currie had met while collaborating on Visage, a studio-based band fronted by New Romantic icon and nightclub impresario Steve Strange. 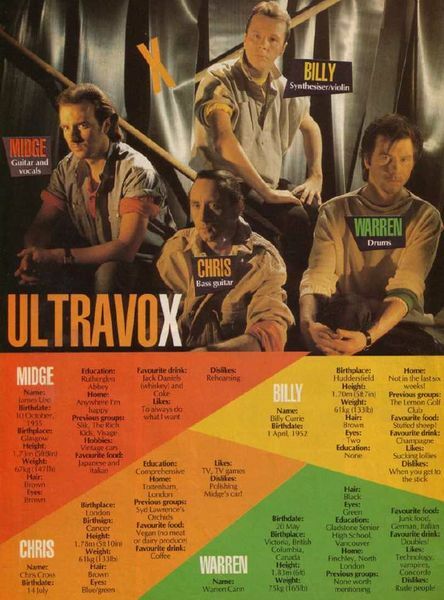 Encouraged by Visage drummer and mutual friend Rusty Egan, Currie asked Ure to join Ultravox. Ure filled both John Foxx's and Robin Simon's posts for Ultravox's next album, Vienna, which heralded a major change of direction and would become their most successful to date, far surpassing any of the previous Ultravox (or Foxx's) albums. As with Systems of Romance, it was produced in Germany by Conny Plank. Ure knew of Ultravox's past, being a fan of Systems to the point where the new four-piece outfit (Ultravox mk. III, often called "the classic line-up") played songs from that album on tours with Ure singing Foxx's lyrics. Released on Chrysalis Records in June 1980, the Vienna album produced the band's first UK Top 40 hit with "Sleepwalk", while the album itself peaked at No. 14. A second single, "Passing Strangers", failed to reach the Top 40, but the band achieved a substantial hit with the third single, the album's title track (inspired by Carol Reed's 1949 film The Third Man). Accompanied by a highly distinctive video, the single became Ultravox's biggest ever hit, peaking at No. 2 in early 1981 (kept off the top spot by Joe Dolce with "Shaddap You Face"). On the strength of the single, the album then re-entered the chart and reached No. 3 in early 1981. A fourth single from the album, "All Stood Still", peaked at No. 8. This was soon followed by Rage in Eden (1981), with the band returning to Conny Plank's studio for what turned out to be a difficult recording session. Whereas the Vienna material had been performed live a great deal prior to a three-week recording process, Rage in Eden took over three months. The album featured a long track in three parts on the second side. The album peaked at No. 4 in the UK, while two singles from the album, "The Thin Wall" and "The Voice", both reached the UK Top 20. Ultravox teamed up with producer George Martin for 1982's Quartet, which peaked at No. 6 in the UK and contained four Top 20 hit singles. It was their most successful album in the U.S., peaking at No. 61. The band undertook a major world tour known as the Monument Tour, which was recorded and released as a live LP and video in 1983, which also reached the UK top ten. 1984's Lament continued the band's run of top ten albums and produced three top 40 hit singles, including the international hit "Dancing with Tears in My Eyes" (UK No. 3). This album was the last to feature the "classic" line-up of the band. Towards the end of 1984, a "greatest hits" compilation spanning the band's 1980s output was released entitled The Collection. It was preceded by a new single, "Love's Great Adventure", which enjoyed massive radio airplay that autumn and eventually peaked at No. 12 in the UK, accompanied by a popular Indiana Jones-style spoof video. The Collection went triple Platinum and reached No. 2 in the UK album chart, the band's highest ever peak. At this time, Ure also co-wrote and helped produce the 1984 Band Aid single "Do They Know It's Christmas?". The group also appeared at Live Aid the following year and played four of their hit singles ("Vienna", "Reap the Wild Wind", "Dancing with Tears in My Eyes" and "One Small Day"). Later in 1985, Ure scored a No. 1 solo hit with "If I Was" and his solo album The Gift reached No. 2 in the UK. Ultravox reconvened in 1986, but Warren Cann was sacked from the band at the beginning of sessions for their U-Vox album. Cann emigrated to the US and retired from music to become an actor. Big Country's Mark Brzezickitook his place. U-Vox was later described by Currie and Ure as "unfocused". Although it continued their string of top ten albums in the UK, the declining performance of its singles prompted both Ure and Cross to leave the band. In 1987 Ultravox decided not to continue, after the U-Vox tour early that year, and split up in 1988. Ure subsequently concentrated on his solo career with varying levels of success, and Cross retired from music altogether and returned to his former career as a psychotherapist. Billy Currie and Robin Simon reunited in 1989 as the short-lived Humania, performing live shows but never making a release until 2006, the album Sinews of the Soul. Since 1979, Ure and Currie had also been part of the Visage ensemble on a part-time basis while simultaneously being in Ultravox. During Ure and Currie's tenure, Visage had released two successful albums and had a string of hit singles (the most notable being "Fade to Grey"), but Ure decided to leave in 1982 in order to concentrate solely on Ultravox. Currie remained with Visage for a while longer, but he too had left them by 1984. Warren Cann, Chris Cross, Billy Currie and Midge Ure reformed Ultravox again for a UK tour in April 2009, entitled "Return to Eden". This would be the first time the classic line up of the band have performed together since Live Aid in 1985. The tour played at venues across the UK. Since success from touring the UK they have extended the tour to Germany and Belgium. In September 2008, both Vienna and Rage in Eden were released in digitally remastered two-disc format with the second disc containing previously unreleased material. Quartet andMonument were released in February 2009, also in two-disc editions. The second disc in the Monument package is a DVD containing the concert video that was previously only available on VHS tape. The other Chrysalis-era releases are planned for similar future releases. A live CD and DVD of Ultravox sell-out Roundhouse show was released on 5 April 2010. The DVD features a documentary filmed on the buildup to and during the reunion tour, much of it filmed by Midge Ure. An anthology of unreleased Ultravox material was planned in mid-2008, but has not been scheduled for release. Speaking to the Sunday Mail, Midge Ure stated that the reunion was only a one-off, and there would be no new material from the group. He said: "We're not trying to recapture our youth and won't be writing new songs or recording another album. This is about celebrating our music and our anniversary." On Jonathan Ross's show on BBC's Radio 2 on 21 February 2009, Ure discussed the tour, with all four members of the most successful incarnation of the band on board. He mentioned that this reunion was not planned in light of the previously mentioned events, but rather was spontaneous and happened very quickly with the band members talking and communicating online (using email and Skype). The interview did not reveal whether or not new material would be recorded as a result of the reunion tour. Ultravox returned to performing live with their Return to Eden II tour during 2010. On 20 January 2011, via their official website, Ultravox.org.uk, the band announced that a new studio album was nearing completion. The band were to release a fan store exclusive superdeluxe EP on CD and 7 inch single via Townsend Records on 14 March. The EP, called Moments from Eden, features four new live tracks and was finally released in May 2012. Ultravox's 11th studio album, Brill!ant, was released on 28 May 2012. Following this release the band embarked on the 'Brilliant Tour' performing shows across the UK and Europe in late 2012. In November 2013 Ultravox performed as special guests on a four date UK arena tour with Simple Minds.